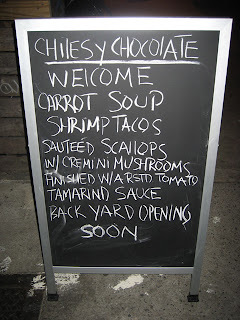 Last night I ate at the new CHIlES & CHOCOlATE Oaxacan Kitchen here in Park Slope on 7th Ave. at Lincoln Place. The food was very tasty, but the menu board writing was hasty. I'll give the author a break for making the lowercase L slightly taller than the adjacent i in CHIlES, and for writing the adjacent A lower in CHOCOlATE. But what follows is no WElCOME sign. Man, that WElCOME is just distracting! And regarding the SCAllOPS, friend and fellow blogger Lilit complained that the double lowercase L's look like the writer forgot to dash an H in SCAHOPS. While I may still eat here again, I will never truly feel 100% welcome. Ahh this one's a beauty. incredible! never realised that thing with lowercase L.
what's the big deal? someone please explain this to me. Why is this stupid thing such a big friggin deal?!?!?!?!?!?!?!?!?!? Now that you've brought the confusing, mangled L to my mind, I will be seeing it everywhere. I would be trying to pronounce all those l's as i's. The miswriters are probably not even Finnish or Hawaiian, which are the only languages I can think of which use a double ii. Accuracy in spelling helps maintain a common language, so we can understand each other. That sign is terrible! I found myself re-reading each lowercase-L at least three times before I could comprehend the meaning. I've been wondering if I should eat there...maybe the sign will be better this week when I check it out. I have always been fascinated by this phenomenon. I laughed out loud at SCAHOPS. SOOO amazed to find your blog. Keep searching, keep posting.